America’s Pledge sends a very powerful message to the world that America is still in the game. 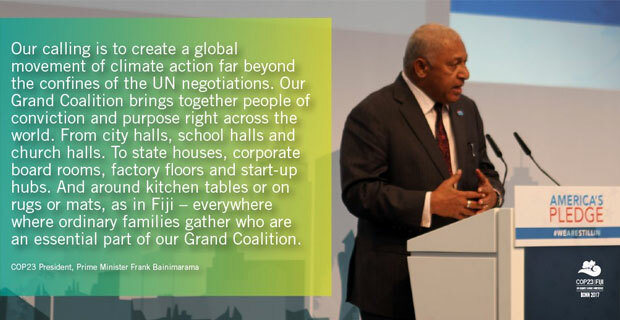 Prime Minister and COP23 President Voreqe Bainimarama has made this remark at the launch of America’s pledge at COP23 in Bonn Germany. Bainimarama acknowledged the allies in building the Grand Coalition which is a centrepiece of Fiji’s presidency, Special Envoy for States and Regions, Governor Jerry Brown of California. He also acknowledged the UN Secretary General’s Special Envoy for Cities and Climate Change, the former Mayor of New York City, Michael Bloomberg. Bainimarama says Brown and Bloomberg bring with them to COP a number of other Governors and a large number of mayors of American cities, who are committed to leadership on climate change. He says Americans who were present for the event have the interests of their fellow citizens at the forefront of their endeavours. Bainimarama highlighted that for Fiji and other vulnerable nations, it is about the survival of the country and the ability of the country to prosper as a nation.